Don't limit your Halloween crafting just to your human family members. Get all members involved, including your fur babies. We've compiled a list of super creative DIY dog costumes to try out on four-legged friends of all sizes. Just be sure to start desensitizing your dog to wearing articles of clothing and accessories prior to Halloween if you want them to wear the outfit for a longer period of time. Otherwise, put the costume on and snap a photo before the dog rips it off. Do your kids have an obsession with Teenage Mutant Ninja Turtles and want to be them for Halloween? Dress up your furry friend to match. This costume is easier than it looks to make. All you need is a turkey fry pan, paint, ribbon, and a dog shirt to get started. If you like knitting, consider giving this dog costume a try. This get-up looks especially believable and cute on lighter toned dogs. All you need to complete the lion's mane is some medium weight yarn, circular knitting needles, and a crochet hook. Have an affinity for space and NASA? Create this space rocket using two-liter soda bottles, spray paint, and tissue paper. You can attach the rocket directly to your dog's harness using duct tape. This DIY dog costume might take longer to make than some of the others, but the end result is totally worth it. Fill the felt M&M's with cotton stuffing to keep the overall costume light and comfortable for your dog. If you want to hop on the unicorn trend, gather up some shiny gold fabric and yarn. To make the costume extra girly, add a tulle tutu for your pup to wear. Just be sure to supervise your dog while wearing this costume so they don't accidentally ingest any yarn. There are a variety of accessories you can add to your dog's collar for Halloween. One idea is to make large Ty Beanie Baby tags using felt. This costume works best with dogs that are small, fluffy and look like stuffed animals. This lightweight cupcake costume is such a cute conversation starter and uses only a few supplies to make. Head to your local craft store and pick up some felt, a paper mache box, cotton batting, and a few tools to get started. If you forgot about a costume and need a last minute DIY idea, consider making either a halo or devil ears for your dog. All you need is some felt, ribbon, pipe cleaners and some hot glue. This costume also works well if your dog doesn't like wearing articles of clothing. Try out this Halloween classic on your dog using medical gauze. To recreate this look, soak medical gauze in brown tea water. Rinse and dry thoroughly, then adhere the gauze to some white dog pajamas. Want to make something Medieval that is worthy of a prize in any Halloween costume competition? 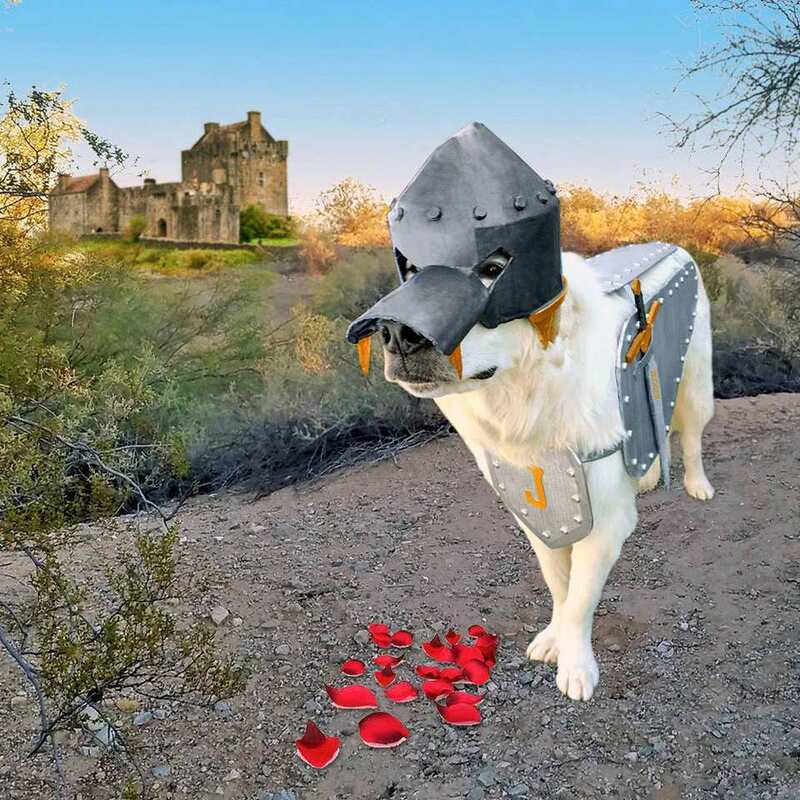 The creative dog owner that made this knight costume used cardboard and other everyday items like cabinet bump protectors and doorstops. It might seem cruel and unusual to paint your puppy, but there is actually pet-safe paint on the market for this such thing. People have painted their dogs into zebras, skeletons, tigers, ladybugs, and more. Your imagination is your only limitation on this one. Depending on your superhero of choice, this costume idea can go a number of ways. Two essentials are a felt mask and a cape. This black ensemble works well for a rendition of Batman. For dogs with shorter coats, dog hoodies are a good idea for long, blustery walks. If you regularly put your dog in hoodies, you can easily transform one into a dinosaur for Halloween using felt and a hot glue gun. Some Halloween costumes aren't so much about trying to be someone else but rather to be something else. One creative DIY dog costume idea is to use toile fabric and white rope to create a giant loofah. All you need to do is adhere the toile to a dog shirt using hot glue or thread. Some wolf-like dog breeds like Huskies make a great big bad wolf from The Little Red Riding Hood. All you need to do is dress your dog up like grandma using a bonnet. If you have two dogs, turn the other one into little red riding hood using a red cape. Add a little gore to your dog's Halloween costume with this clever dagger in the throat collar. Transform a piece of felt into a bloody collar. Next, use lightweight cardboard to make a fake knife. ​The original creator used a cereal box. Harry Potter fans have found dozens of ways to transform their pooches into their favorite Wizarding characters, and the results are beyond cute. You can repurpose scarves and glasses you own, or you can make glasses using pipe cleaners. This Halloween costume is super easy to recreate using cardboard, a Starbucks logo, and a to-go coffee lid as the hat. If you have a different local coffee shop you prefer, just swap out the logo. You don't need to own a sewing machine to be able to put together some intricate dog costumes. Take this pirate costume, for instance. You can repurpose an old tank top and then adhere some pirate accessories using a hot glue gun. The two main components of this garden gnome costume are felt and craft fur, which can be found at your local craft store. The mini mushrooms add a whimsical touch and are perfect for photo shoots. Many cute dog costumes come in the form of food, but this idea is especially clever. Who would have thought making a s'mores costume could be so simple to make and is relatively inexpensive? Purchase a white vest that fits your dog, then glue on some brown felt and cardboard graham crackers. This DIY dog costume idea is less tedious to make for smaller dogs, but it could prove to be utterly time-consuming for larger breeds. Using a hot glue gun, adhere strips of crepe paper to an already assembled dog sweater. Mini sombrero sold separately. Some breeds just have such photogenic qualities that virtually any costume would look absolutely adorable. Such is the case for Maya the Bulldog, who is a popular fixture on Instagram. You can find her dressed in a variety of costumes, but this one is especially easy to replicate. All you need is a floral scarf and some play glasses. This clever idea repurposes a stuffed animal into a cute small dog costume using cardboard and a coat hanger. Though it might not be comfortable to wear for a long period of time, it is perfect for a fun family photo. This costume is perfect if you plan to take your dog along with you trick-or-treating because it is lightweight and comfortable. The other nice thing is that this project is completely handmade, so you can customize it to fit your dog perfectly.